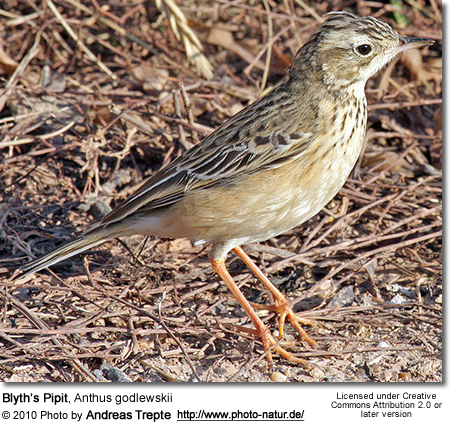 The Blyth's Pipit, Anthus godlewskii, is a medium-sized passerine bird which breeds in Mongolia (in East and Central Asia) and neighbouring areas. 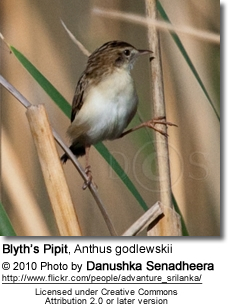 It is a long distance migrant moving to open lowlands in southern Asia. It is a very rare vagrant to western Europe. 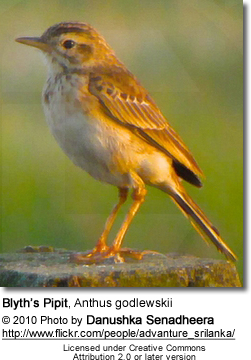 This bird was named after the English zoologist Edward Blyth. 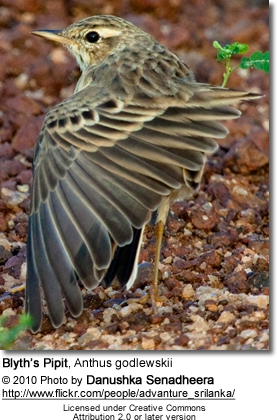 This is a large pipit, but is an undistinguished looking species on the ground, mainly brown above and pale below. 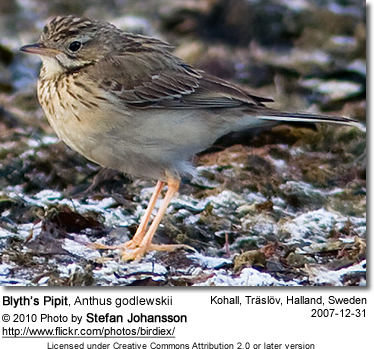 It is very similar to Richard's Pipit, but is slightly smaller, shorter legs and a shorter dark bill. In south Asia, in winter some care must be taken to distinguish this from other large pipits which winter or are resident in the area, including Richard's. Its flight is strong and direct. It gives a characteristic "pshee" call, higher pitched than Richard's. Copyright: Wikipedia. This article is licensed under the GNU Free Documentation License. It uses material from Wikipedia.org ... Additional information and photos by Avianweb.